take regular rice, urad dal and methi seeds in a bowl. here i used urad dal with their husks (out of stock with the husked urad dal) and i had to remove the skins after they had soaked well. rinse all three for a couple of times in water and then soak in enough water in the same bowl for 5 to 6 hours. drain and add the soaked rice, cooked rice, urad dal and methi seeds. also add coconut milk to a wet grinder jar. add coconut water in parts and grind everything to a smooth batter. a slight grainy texture of the rice, in the batter is fine. pour the appam batter in a large bowl or pan. add rock salt and sugar. stir and cover the batter. keep aside for fermentation overnight or for about 10 to 12 hours or more if required. the batter, will double up a bit and also increase in volume. the consistency of this batter is slightly thin than the dosa batter and of a pouring consistency. so if the batter appears thick, then you can add some coconut water or regular water to the batter and mix well. add baking soda to the batter. mix very well and keep aside the batter covered for 15 to 20 minutes. you will see bubbles in the batter after adding baking soda.you can also add eno fruit salt, instead of baking soda. just ¼ tsp of eno salt would be enough. then take an appam pan or a small kadai with handles. if using an iron kadai, then smear oil on the kadai. for non stick kadai no need to smear any oil. with a large spoon or ladle, pour the appam batter. hold the kadai handles & swirl it, so that the appam batter spreads evenly in a round shape and you get a thin layer of batter at the edges. sprinkle coconut oil on the sides if required and cover the pan or kadai with a lid. cook till the appam gets cooked and the base is light golden. remove the lid or cover and gently lift the appam with a spatula. 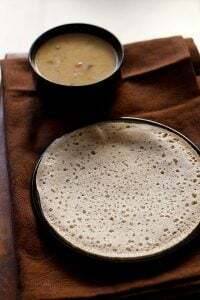 serve appam hot or warm with veg stew or coconut chutney or kadala curry. @2014. Picture Window theme. Theme images by Maliketh. Powered by Blogger.